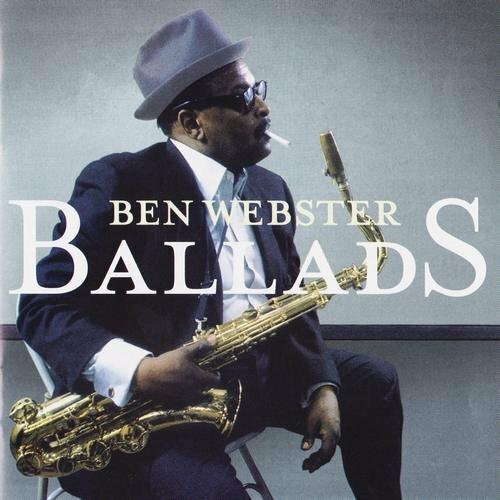 In the 1950s, tenor-saxophonist Ben Webster was at the peak of his powers. His musical personality really featured two separate emotions: harsh and tough on the faster pieces and surprisingly warm and tender on the ballads. 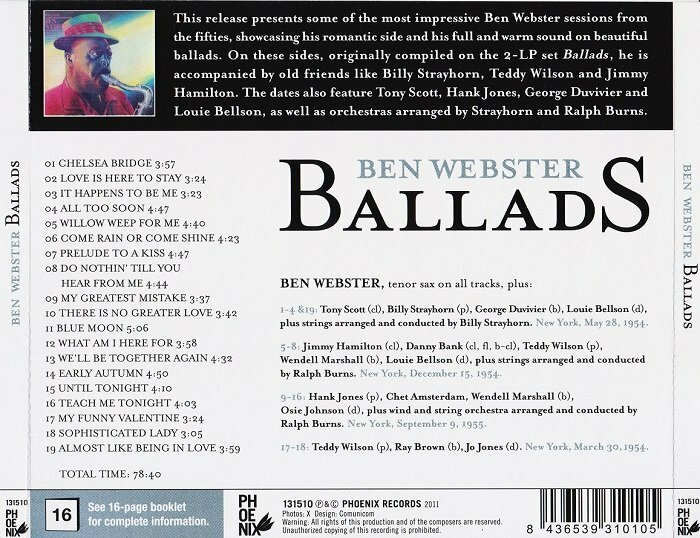 Webster uses the latter voice throughout this two-LP set. 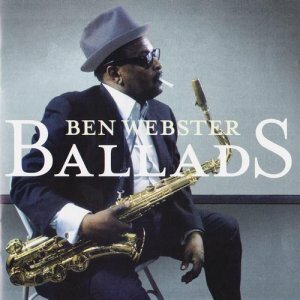 On all but four of 20 selections, Ben is backed by a string section arranged by Ralph Burns (except for "Chelsea Bridge" which was arranged by Billy Strayhorn) and, although clarinetists Tony Scott and Jimmy Hamilton and pianists Teddy Wilson and Hank Jones are heard from, the focus is otherwise entirely on the great tenor. The final four numbers, which matches Webster with Wilson in a stringless quartet, also stick to ballads. Music that is both beautiful and creative. #1-4 & 19: Tony Scott (cl), Mac Ceppos, David Novales, Mischa Russell (vln), Richard Dickler (viola), Rudy Sims (cello), Billy Strayhorn (p, arr, cond), George Duvivier (b), Louiу Bellson (d). (Webster, Strayhorn, Duvivier & Bellson only on track 19). New York, May 28, 1954. 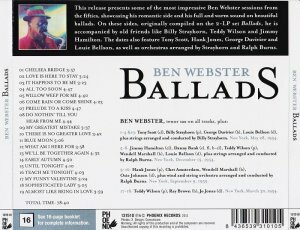 #5-8: Jimmy Hamilton (cl), Danny Bank (cl, fl, b-cl), Sol Deutsch, Leo Kruczek, Julius Schachter, Jack Zayde (vln), Burt Fish (viola), Bernard Greenhouse (cello), Teddy Wilson (p), Wendell Marshall (b), Louie Bellson (d), Ralph Burns (cond, arr). New York, December 15, 1954. #9-16: Danny Bank (fl, cl), Al Epstein (cl, Eng-hrn, b-cl), Harold Coletta, Martin Donegan, Leo Kruczek,Harry Lookofsky, Gene Orloff, Tosha Samaroff, Paul Winter (vln), Burt Fisch (viola), Abe Borodkin, George Ricci, Lucien Schmit (cello), Hank Jones (p), Chet Amsterdam, Wendell Marshall (b), Osie Johnson (d), Ralph Burns (arr, cond). New York, September 9, 1955. #17-18: Teddy Wilson (p), Ray Brown (b), Jo Jones (d). New York, March 30, 1954.